The Bureau of Educational and Cultural Affairs (ECA) is pleased to announce the FY 2017 competition for the U.S.-ASEAN Visiting Scholar Initiative 2016, regionally competed awards for Visiting Scholars that will support research in fields related to ASEAN issues. 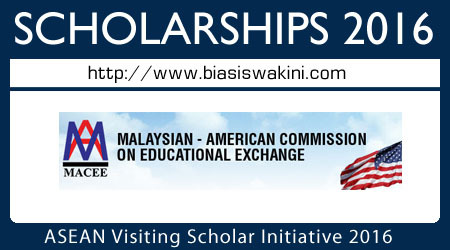 The Fulbright U.S.-ASEAN Visiting Scholar Initiative is open to university faculty, foreign ministry and government officials, and professional staff of private sectors, think tanks and other NGOs in ASEAN Member States to travel to the United States for scholarly and professional research for three to four months on issues that are relevant ASEAN and central to the U.S.-ASEAN relationship. Nominations will be accepted from all ASEAN Member States. It is anticipated that 10 qualified applicants will be selected, preferably representing all 10 Members States. In FY 2017, Fulbright Visiting Scholars may apply to lecture and conduct research in fields that will support ASEAN initiatives such as supporting regional economic integration, expanding maritime cooperation, promoting opportunities for women,fostering green growth, and addressing transnational challenges (including human trafficking, climate change, sustainable fishing, wildlife trafficking, and countering violent extremism). These fields can include: Education, Environmental Sciences, Financial Market Integration, Food Technology, Information Sciences, Journalism, Law, Political Science, Public Administration, Public/Global Health, Statistics, Trade and Investment, Trade Facilitation, and TEFL & Applied Linguistics. These programs and topics should also be of interest and relevance to the nominating country and Commission. their program in the United States. professionals in think tanks and other NGOs whose work focuses on U.S.-ASEAN issues. who have not had recent and substantial experience in the United States. History and Examination Report before their grants can be finalized. received a Fulbright grant within the past five years. Fulbright U.S.-ASEAN Visiting Scholar proposals should be carefully developed projects that will deepen the applicant’s understanding of one or more aspects of the U.S.-ASEAN relationship. While it is expected that the majority of time will be spent in research, grantees are also encouraged to expand and develop their network of professional contacts so that professional relationships established during the grantee’s time in the United States can be sustained after the formal grant period has ended. In addition, grantees will be expected to seek opportunities to provide an ASEAN perspective during their time in the United States through guest lectures, seminars, or participation in academic or professional conferences. All applicants are urged to explore possible affiliations with U.S. institutions, including universities, think tanks and research institutes, in advance of submitting their formal applications. Letters of invitation will enable program organizers to make the most suitable affiliations. Fulbright U.S.-ASEAN projects should coincide with traditional fall/spring semesters, starting in September and ending in December, or stating in January and ending in May. Applicants should select “U.S.-ASEAN Fulbright Initiative” in the menu. Otherwise, please select “Fulbright Visiting Scholar Program” and indicate clearly “U.S.-ASEAN Fulbright Initiative” as part of your project or research title. Under question #4, “Category of Grant”, please be sure to indicate whether you are applying for a ‘Research’ or Lecturing/Research’ award. - One direct-flight, round-trip economy-class air ticket. - A one-time $1,250 Professional and Settling-in allowance. - Qualifying university lab and research fees up to $3,000 as necessary. - No dependent support will be available. Please note that the interview is tentatively scheduled for November/early December 2016 and only shortlisted candidates will be called for interview. 0 Komentar untuk "ASEAN Visiting Scholars Initiative 2016"